It’s almost time for me to begin training for the Quad Cities half-marathon. Last year I ran 1:49:17 (8:20/mi). This year, while I’d like to run 1:30 (ha! ha!) I’m shooting for 1:45 (8:00/mi). So this week, I’ll run a 5K and 10K to see if that’s a reasonable pace. Run Less, Run Faster (the FIRST book) says equivalent performances would be 22:40 and 47:00 respectively. So I’ll be heading to the track, printed splits in hand, to aim for those marks. Given that I ran a 23:30 5K less than two weeks ago, and I didn’t think I was pushing myself that much, I’m optimistic. The 10K will be the real test. Halfway through the plan, weeks with very long runs (over 13.1 miles) alternate with weeks with longer intervals and tempo runs. So while the distance looks a little jumpy from week to week, effort is pretty consistent. I hope to swim and bike each week as well, given the FIRST 3+2 philosophy. With 400 miles of running, I’ll be looking at between 550 and 650 miles total, depending on the amount of cross-training I actually do. Last year, I was pretty regular, falling short only four weeks. This year, with no teaching to get in the way, I aim to do it all. Data dump: here’s an OpenOffice spreadsheet with the running distances, including a 1.7mi combined warmup and cooldown for each track workout (my round-trip to the Macomb High track), and warmup and cooldowns when not integrated into tempo runs. For long runs, I just start slow, as FIRST recommends. 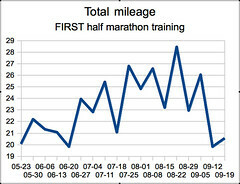 This entry was posted in Running and tagged FIRST, half, QC Marathon, run. Bookmark the permalink.